This pizza is a classic recipe from Puglia, in southern Italy. Potatoes are boiled and mashed with a little flour, salt and eggs to make a smooth dough. 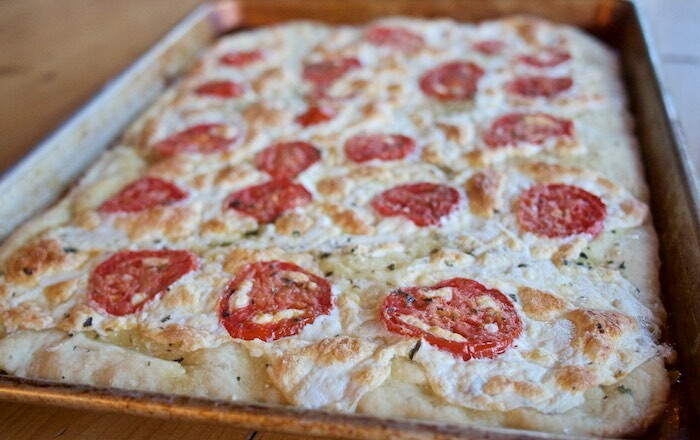 Spread into a pan, the dough is than topped with mozzarella, tomatoes, a drizzle of olive oil and your favorite herb. It's a delicious and utterly filling pizza that is super easy-to-make. Preheat the oven to 350 degrees F. Put the unpeeled potatoes in a pot with water to cover by a couple of inches, and bring to a simmer. Cook the potatoes until they are easily pierced with a knife but not falling apart, about 20 minutes. Let them cool slightly, then peel, and press through a ricer onto a sheet pan. Let them cool completely on the pan. Scrape the potatoes into a bowl, and sift the flour, baking powder, and salt over top of them. Mix in the egg to make a smooth dough. Oil a large 15x10 cookie sheet with olive oil. On a floured surface, roll the dough out to a rectangle almost as large as the cookie sheet. (If the dough is difficult to roll, roll between layers of parchment paper.) Transfer to the cookie sheet, and press the dough out so that it almost reach the edges of the pan. Top the dough evenly with the mozzarella, leaving a ½–inch border around the edges. Top with the sliced tomatoes, and drizzle with olive oil. Sprinkle with dried oregano and grated cheese. Bake until the crust is browned on the bottom and cooked through, about 35 minutes. Allow the pizza to cool on the baking sheet for a few minutes before cutting into squares to serve. I knew that crust would be amazing! What a great pizza!! !